External hard drives are super handy when it's time to back up your PC: just plug in, copy files and disconnect. Leaving backups on the network, or a connected drive is starting to get risky. In the face of "ransomware" like Cryptolocker (see this 12/24/2013 BBC.co.uk news story), it's looking more and more like offline backups are the smarter way to go. Offline backups are immune to network viruses and you can place the physical storage device in a secure offsite location which helps against disaster and fire related threats. If you go Offline, there are no Cloud or SAN servers to get hacked, no internet pipe for the NSA to tap into Nineteen Eighty-Four style, just your data sitting in powered off hard drive under actual lock and key. This is nothing new of course, there are literally hundreds of external 3.5" and 2.5" hard drive devices you can choose from, though it does pay to stick to better quality manufacturers in our experience. 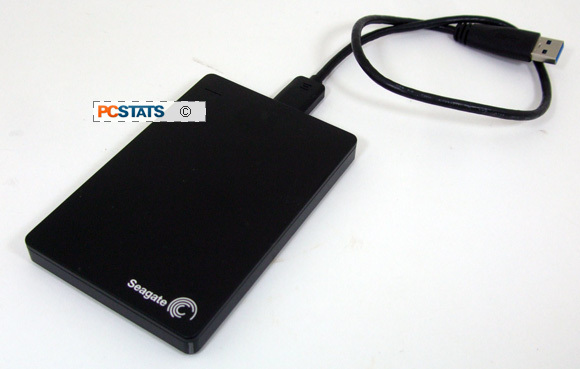 The focus of this PCSTATS review is Seagate's 2TB Backup Plus Slim external USB 3.0 hard drive. The Backup Plus Slim is a self-contained 2.5" SATA-600 interface hard drive in a black aluminum and plastic enclosure which connects via USB 3.0 cable to any PC or Mac computer. The whole package weighs 150 grams and is just over 12mm thick - about the size of a smart phone. Power for the drive is supplied via the USB 2.0 or USB 3.0 port. The Backup Plus Slim looks every bit like the Monolith from Kubrick's 2001:A Space Odyssey, but inside is a not particularly remarkable 5400RPM, 3-platter hard disk with 32MB of cache. The 5400RPM drive does the job, but certainly won't break any speed records. Seagate's Backup Plus Slim is covered by a 2 year warranty and costs $159 CDN at CanadaComputers.com. INCLUDES: Digital User Manual, USB 3.0 cable, software on drive for sync'ing data and backups. HDD Interface: SATA-600 to USB 3.0. I view backup drives as tools, consumable tools in some respects because they often take a beating. The drive and enclosure ought to be fairly robust, with mechanical cable connections that won't snap off in the faintest of breezes. On top of that, the external drive should make an effort to bundle software which makes the whole chore of backing up, easier. I have no time, nor patience for bundleware aiming to sell disk space on some distant server. In this respect the Seagate Backup Plus Slim wins and looses. First, the little feature that caught our attention. Backing up your content from social media websites is not simple. I don't know why Facebook, Flickr, etc. don't have a one-click "download a complete archive of all your data" button, but they don't. Seagate steps up to the plate with "a download a complete archive of all your data" button for Facebook and Flickr. Using the Seagate Dashboard software that ships with the Backup Plus Slim external hard drive, we can enter our login information and instruct the script to quickly download everything from these social media platforms by the extremely complicated process of.... checking the "AutoSave" box. We tested the Facebook tool and then re-tested it a few more times as word spread around the office there was a quick was to get data off Facebook. This little black box made the rounds! 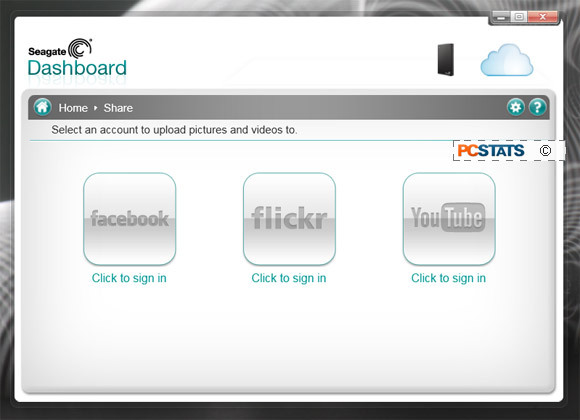 Seagate Dashboard limits itself to images and videos, you're SOL for text notes or any other Facebook application data. The first user test consisted of 3424 files (videos/images), totalling 244MB - this was downloaded in ~23minutes to the default Seagate Backup Plus Slim /My Online Documents/Facebook folder. The drive was connected via USB2.0, but internet speed is the limiting factor here. The next test was 1237 files totalling 144MB, which took about 6 minutes. So, roughly 10-24MB/min, give or take. The same scripts can also be used to bulk-upload content to Facebook, Flickr and YouTube. 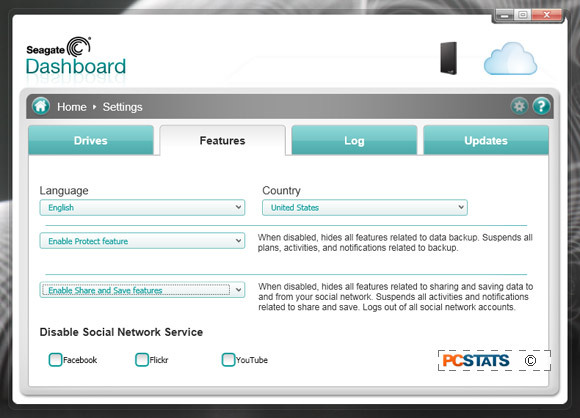 The social media features can be enabled or disabled via this simple control screen. So for example, if you want to download a friends data, it's easy to do so without giving Seagate Dashboard unrestricted access to your social media accounts. Do be mindful of not allowing it to advertise itself in your feed, there is a prompt asking permission to post as you during the FB login stage. 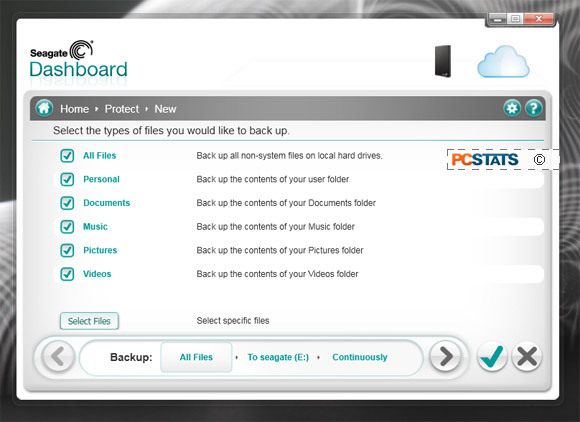 Seagate Dashboard has several other tools to facilitate easy backups from a notebook or PC, either by specifying types of files, locations or configuring a set schedule. It's also smart enough to back up pre-defined files whenever they change, which is a nice option to have and one that can reduce backup time and overhead. These are fairly rudimentary backup (and restore) options, but PCSTATS is happy to see them regardless. 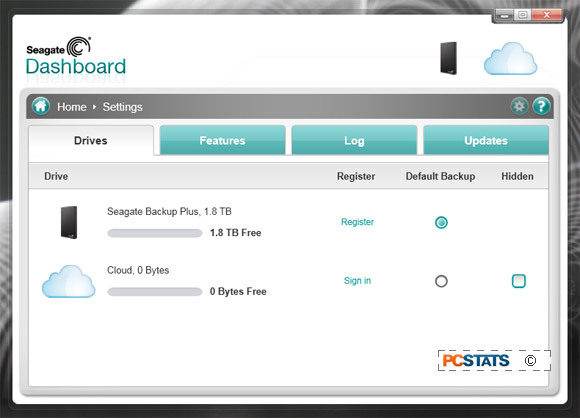 If you subscribe to Seagate Cloud Storage, the Dashboard also permits direct access to that account information via this interface. Thankfully, Seagate isn't heavily pushing this service on its users via Dashboard. There's not much to the 2TB Seagate Backup Plus Slim External hard drive, so let's take a quick 360 view of the unit and its one connecting cable.